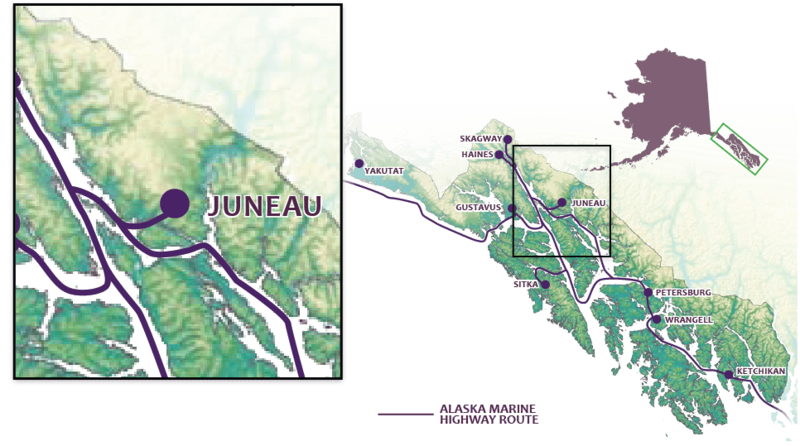 Juneau, like many communities along Alaska’s coastline, is accessible to car and RV travelers via the Alaska Marine Highway System (AMHS), Alaska’s state ferry system. The ferry offers reliable service at the end of the hard surface road connections in Bellingham, Washington, Prince Rupert, British Columbia, Haines and Skagway. You can drive your vehicle on board and enjoy a leisurely cruise, winding its way through the Inside Passage communities of southeast Alaska. Two full-service RV parks, in addition to two USFS campgrounds, are available in Juneau. Mendenhall Lake Campground has 69 sites and 15 RV sites offering offering water, vault toilets, a dump station and views of Mendenhall Glacier. The Auke Village Campground is located 15 miles from downtown Juneau and 1.5 miles west of the state ferry terminal at Auke Bay and has 11 campsites.